Every year, I'd promise my PMR students a trip to Sibu if they achieved an A in the PMR English exam. 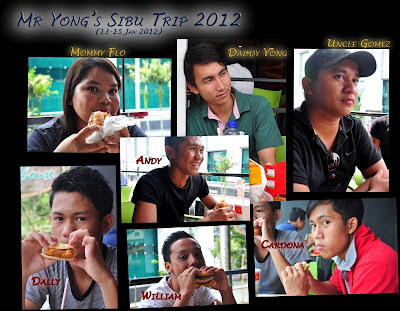 To them a trip to Sibu would be the equivalent of a trip to KL for a kid from Kuching or Penang. Imagine a fully sponsored 3D2N trip. Throw in a movie ticket, meal at McD, dinner at a good Western restaurant, shopping at malls, fashion tips, free massage chair sessions & being chauffeured around in a Toyota Rush. It may not be much to many of you reading now but to a 16 year old from a humble background, that's an unbelievable opportunity! I believe in rewarding hard work. I also believe in giving good gifts. Remember teachers & especially PARENTS, a reward has actually got to be rewarding! Spend some time doing research about the aspirations of the recipient & tailor your gift accordingly. Even the most exorbitant gifts may not compare to a meaningful simple heartfelt gift. Dont give someone a piece of something they dont want & expect them to appreciate you for it. Good gifts require heart. Why did I choose to bring them with me on a trip instead of just spending the equivalent amount of money on some kind of material thing they would want? I believe in personal touch & making a difference in the lives of others. I believe that they need to experience a different land & a different lifestyle to be able to broaden their mental horizons. I believe they trust me enough to accept my philosophies. I want them to dream bigger dreams not only for themselves or their families but even more so for their people back in the jungle. These humble children will one day change their hometown. I believe in this very strongly & that is what I impress upon them all the time. Go & be successful. But do not forget your roots. Come home & lift up your people. Whether they like it or not. I started with the 2010 PMR students, at that time I taught the top class. I needed a reward so great (cost effective & enjoyable for me too) that it would actually get the As to keep getting As & motivate the Bs to work for an A. That year, 4 students achieved A in PMR English. I was true to my word & I took them on a great trip to Sibu. You can read about it here. Last year, in 2011, I did not teach the top class. Instead, I was in charge of raising the passing percentage in the middle classes. Still, I promised those classes, I'd take them to Sibu if any of them got As. There were some prospects & I was hoping for 1 of them to actually achieve an A. She didn't. Only 1 student in 2011 achieved an A in PMR English. He was from the top class & was not my student so I was not obliged to organise a trip for anyone but I decided to do so anyway because I wanted to motivate the 2012 PMR students. This year, 2012, I'm back in the top class & this time I am confident of getting 2 digits worth of As. I set a target for 10 of them to work hard for the next 9 months to achieve an A. I want all of them to get an A. The cost of their trip would be monumental! But it's a price I'm willing to pay. I believe I'm investing in their futures & also in the general future of the people in the area. This year it's 4 students & 1 teacher featuring 3 awesome teachers in Sibu. William was the PMR English A student. He also achieved 7As. Well worthy of my reward. Alone, he would most probably be bored to death so I invited the only other 7As student, Dally. However, I felt that 2 was still too little so I brought the Head Prefect, Andy (F5), & his deputy, Cardona (F5), along as well. They got along just fine & had a blast! I was nursing a fever & flu that weekend so I enlisted the help of several other teachers who were more than willing to pitch in & go the extra mile for these students. Clement for taking us to a good Western restaurant & paying for dinner! This is not the only thing I'm doing to motivate the PMR students. There are a lot more I do in my personal time. I will share them on my blog in due time. I am also always looking for new ideas. If you have some, do share! Now go, think about what you can do in your school to lift up the students & give them a reason to excel! No excuses please, you have a degree for a reason.